Montessori Basics: What is ‘Practical Life’? As Montessorians we believe education is more than just academics. We aim to nurture not only the intellect, but the development of the whole child in an effort to prepare them for all aspects of life. Practical life in Montessori begins early; you will find these activities intentionally woven into both toddler and primary classrooms, and beyond. The activities themselves are intended to give children practice so that they may work toward being independent in everyday living. Read on to get an understanding of what this looks like in the classroom, and what parents might do to continue this important work at home. Children are not only capable of caring for their environment; they enjoy the process, especially when they are very young. 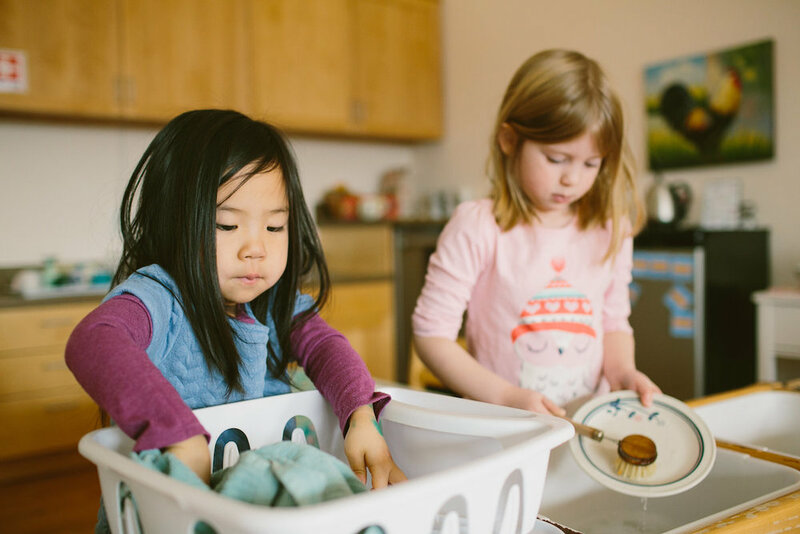 In Montessori classrooms children are given lesson on how to clean up spills, care for pets and plants, wash dishes, fold napkins, and clean tables. Each of these lessons is given slowly and methodically, with the adult modeling the correct way to complete each activity. Children are given tools that are sized to work for them, and these tools are placed within reach of the child so that they may access them independently. This work can be easily continued at home. Take the time to model household activities for your child, keeping in mind you will likely need to model the same activity multiple times. There are a variety of child-sized tools available for purchase, but those are not necessary to accomplish the goal. For example, if you would like to teach your child how to clean floors, this great set is available, or one could simply use a rag and a spray bottle. Small dustpan and brush sets are easy to find, too, and will be used for years to come. Designate a small corner of your home to store these items. A small bin or basket is helpful, or perhaps low hooks on the wall. By teaching children how to care for their environment, they gain confidence and independence in their ability to function as a contributing member of the family (or classroom!). In most Montessori primary classrooms observers will find a line taped on the floor. This is placed there as an opportunity for the students to hone their gross motor skills. Children are meant to walk slowly and with purpose, keeping their feet on the line and balancing as they go. Sometimes the addition of a bell can add challenge to the activity, with a child walking carefully so as not to allow the bell to ring as they move. Similar activities can be done almost anywhere at home. Children naturally gravitate toward walking and balancing on logs, curbs, or anything else they come across. The challenge for many of us as adults can be to notice the importance of this activity in the moment, to slow down, and to allow for the child to immerse themselves in the experience. While it’s not always possible to stop and do this, your child will feel immense pride and accomplishment if they have the opportunity to slow down and just walk. Montessori teachers also provide lots of fine motor experiences for children. In their classrooms, there are opportunities for pouring (rice, beans, water, etc. ), transferring things from one container to another, and using a variety of implements to do so. Wondering how this might look at home? Try letting your child help out in the kitchen. There is no shortage of scooping, measuring, and using of tools that require concentration and fine motor development. One excellent marker of indepence is how well we are able to care for ourselves. In Montessori schools children are taught from an early age how to do simple things, such as put on and remove their shoes and coat by themselves. They are expected to do this daily and they take great pride in doing so. At home parents can start by allowing children to choose their own clothing (within weather-appropriate parameters) and to dress themselves. Clothing can be kept on low shelves and in low drawers so that the child may access it easily. One fun element of this area of practical life is food preparation. Children are given lessons on how they might prepare a simple snack. This might include chopping of fruits and vegetables, spreading things like hummus or cream cheese, stirring ingredients together, or any other number of simple skills. All materials and food are left on a table for the children to access throughout the morning so that they may try the activity for themselves. Food preparation is a fun and natural activity to repeat in the home. Grace and courtesy refers to how we might teach children to be respectful and polite to others. Much of this work centers on adults modeling the correct vocabulary and movements associated with being polite and courteous in our society. We teach children to say “please”, “thank you”, “you’re welcome”, and “excuse me”. We encourage them to hold doors for each other, to offer food to one another, and to check in with anyone who is feeling hurt or upset. Grace and courtesy is also about helping children develop empathy. We are social beings who need to live together peacefully if we are to accomplish anything. Montessori believed that children are the key to peace among humanity. This important work begins with simple practical life lessons, and continues throughout childhood and beyond.